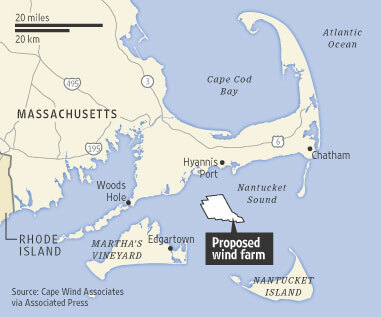 The 130-turbine wind farm off Cape Cod that Ted Kennedy worked so hard to block for ten years finally got approval. Kennedy, worried over it spoiling his views off his Cape Cod retreat, claimed he opposed it because corporations would benefit. Huh? The only difference with this boondoggle from others is that it occurs in Ted’s back yard. There is something really cool looking about this picture of future offshore wind turbines stretching into the haze of a lazy summer afternoon off the Cape. This is an area of extraordinary scenic beauty, plenty of boaters, and lots of commercial traffic. While it may have worried the Kennedy’s for the hypocrisy, they had a point. Of all the places to build the first offshore farm, why pick this one? In June, July, and August the thermal winds of Kalmus Beach kick in and account for 99% of the wind statistics for these months in the season. The rest of the Cape may have shut off by this time. Kalmus Beach is the beach off Hyannisport, the locale of the Kennedy Compound. The only place this project made sense is in the Kennedy back yard! The turbines would stretch over an area the size of Manhattan, right in the middle of a lot of traffic: the ferry to Nantucket will go along one side, the ferry to Martha’s Vineyard goes along the other, and the main shipping channel goes along the bottom side. They will not only see the turbines, they will hear them: large windmills make lots of annoying, high-ptiched noise. Maybe it is a good thing that the wind often dies during tourist season. The turbine part costs a cool $1B, but the grid upgrades would cost $10B. The promoters want to dump the grid costs onto the public. As consequence this approval simply shifts the fight from the Federal level to the State. Since the buildout will probably take as long as the Big Dig that went through Boston – a fiasco that became the most expensive highway project in US history, almost 10x over budget – there will be plenty of chances to scuttle it, and lots of waste for Kennedy’s feared “corporations” to take advantage of. The Big Dig had huge problems and is plagued with substandard materials. Offshore wind also is more expensive than onshore, roughly 2x for the turbines, and much more for the grid. It is difficult to ever see it paying off, since the unreliability of wind requires backup capacity to be built alongside the turbines and grid, typically done with natural gas. Those plants end up under-utlized, which raises electricity costs due to the amortization of capital costs rather than lowering them due to lower operating cost of renewable energy. Wind in general has been a super boondoggle, producing much less energy than expected, wearing out faster, killing birds (lots of birds) and causing health problems (from noise for people who live within a mile). In Texas, the leading wind power state, the actual energy generated is less than 10% of potential. Worse, those winds that sweep the flat parts of Texas tend to fail just when they are needed most, on a hot and humid summer day in Houston. No surprise then that wind farms only get built with massive subsidies.